Millions of people will be familiar with delta links, also known as delta rings and links or simply as D rings. They are used in road transport operations to keep loads lashed securely onboard HGVs. We sell delta links in many sizes and styles to suit any application. 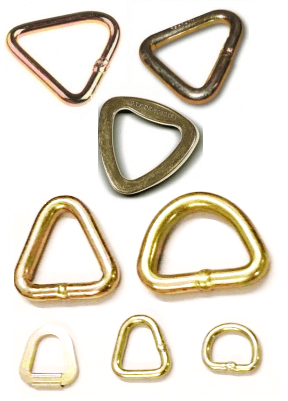 Delta links are usually welded in the classic ‘D’ shape, allowing them to be stitched into a lashing strap and hooked onto an anchor point in a matter of seconds. Some delta rings come with a locking screw which means that they can be added and removed to an assembly at any time, rather than being a permanent fixture. This acts a little like the safety catch of our flat snap hooks You can order either kind from Rope Services Direct, as well as specifying an entire custom ratchet strap solution that is made to measure. In addition to producing delta rings made from a tubular strip of metal wire, we can also offer links that have been pressed completely flat, making them more compact. Check out the full range of ratchet strap fittings on our site, read up on the benefits of safe cargo transport and buy the best products for the job at hand. Need to Know More About Delta Links? You can find out further details on delta links and the full range of products we sell at Rope Services Direct when you contact our support staff today. Why not give us a call on 01384 78004? If email is more convenient, our online contact form can be found here. Delta Links Overall rating: 5 out of 5 based on 6 reviews.